Unintentionally, it seems to be Japanese/American novel-in-verse week here at Devour Books! 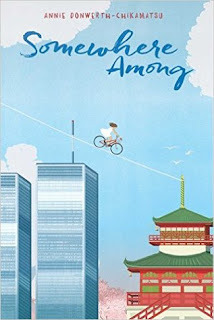 When I saw Somewhere Among listed on NetGalley.com, I was eager to see Annie Donwerth-Chikamatsu's take on this theme. 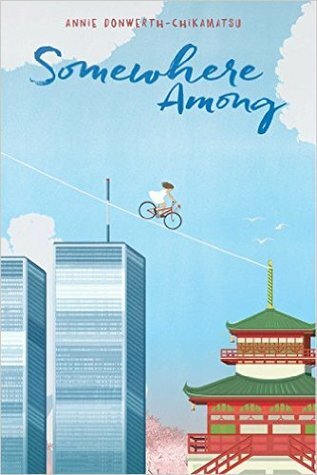 I've read many of Holly Thompson's novels in verse, which usually are about feeling foreign, but in Somewhere Among, our protagonist Ema feels entirely at home in Japan. Although her mother is American, Ema is culturally Japanese. Other people may see her as foreign, but she thinks and acts like a Japanese child. I loved the glimpses into Japanese life and that Donwerth-Chikamatsu trusted the readers enough that she didn't explain everything in detail. For me, the best part of the book was feeling fully immersed in Japan while reading. Unfortunately, the book was very sad and I don't know many middle grade readers who can take this much tragedy in a book. Somewhere Among features September 11th, living away from a beloved father, a bully whose mother hits him, a sickly grandfather, a mean grandmother, and a mother whose pregnancy puts her own and her baby's health in danger. The young readers I know could handle one or two of those problems, but it was fairly overwhelming. For foreigners living in Japan, there are never enough books to support your experience. Everyone else should read Holly Thompson's books.